Boston Store Building. Photo by Jeramey Jannene. 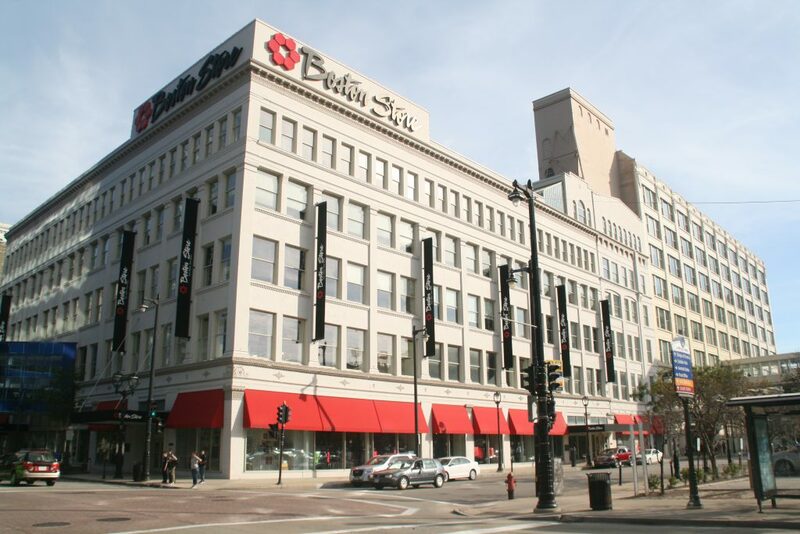 After Bon-Ton’s bankruptcy, what happened to the $1.9 million subsidy the city gave to Boston Store’s parent company to redevelop its headquarters in downtown Milwaukee? Much of the cash actually still exists, sitting in an escrow account according to Department of City Development senior development specialist Dan Casanova. But what happens next remains undecided. The city’s tax-incremental financing or TIF expert was before the Common Council’s Zoning, Neighborhoods & Development Committee Tuesday morning to provide details on a proposed $9 million subsidy for the redevelopment of the Shops of Grand Avenue mall. But before he could go into detail on the proposal, council members began asking about the Boston Store cash. In early 2017 the council approved a deal to provide a $1.9 million forgivable loan to the struggling retailer. The plan called for Bon-Ton to maintain its downtown store and corporate headquarters at 331 W. Wisconsin Ave. The loan, intended to support the unprofitable downtown store, was to be forgiven in exchange for keeping 750 corporate jobs in Westown for at least 10 years. That plan was modified in late 2017 after North Wells Capital, a Chicago-based real estate firm, bought the building. The firm came up with a plan to cut the store’s size in half and relocate the corporate headquarters to the building’s lower floors. The plan, said Casanova at the time, would have saved the retailer money and freed up space in the building for other tenants. North Wells was to contribute $2.1 million of its own capital. But Bon-Ton declared bankruptcy in February 2018 and its assets were liquidated over the subsequent months. What happened to the city’s cash? “The funds did not go to Boston Store. They were specifically for construction,” said Casanova. Approximately $600,000 was spent, much of which went to demolish part of the department store in anticipation of a conversion to office space. “Is that a loss? Do we write that off? Is that a bad investment?” asked Alderman Russell W. Stamper, II. Casanova said the city wasn’t going to be able to collect on the $600,000 because the three-party agreement had a clawback provision only with the now-bankrupt Bon-Ton. Ald. Robert Bauman, who like Coggs has a law degree, rendered a quick opinion. “I’m not sure we would be a creditor at all because they didn’t receive the money,” said the alderman. North Wells Capital, after losing its anchor tenant, has proceeded with a plan to rebrand the building under the name Hub 640 and attract other tenants. The Boston Store building, which includes apartments on the upper floors, is attached to the former mall complex that is also being redeveloped. Casanova said the $600,000 that was spent went to work that would happen under any redevelopment scenario. So what happens to the $1.3 million sitting in escrow? “We are having discussions with the developer about returning that to the city or potentially using that for a redevelopment effort,” said Casanova. He told the committee that any action would require council approval. The building sits in the middle of a number of major redevelopment projects. The mall to the building’s east is being reconfigured into an office complex and food hall. Just northeast of the former departmen store the Milwaukee Symphony Orchestra is investing nearly $100 million in transforming Grand Warner Theater into a music hall. The city is studying extending the streetcar to the surface parking lot located immediately west of the building. The $1.9 came from a TIF district that was originally created in 1998 to support the redevelopment of the mall and surrounding buildings. The 2017 amendment also included $750,000 for the symphony’s project and $5.1 million in area public infrastructure improvements, including high impact paving projects and rebuilding large segments of N. 2nd St., W. Wells St. and N. Plankinton Ave. The TIF district, supported by increased property tax revenue from properties within the district, was expected to close in 2020 at the time of the subsidy’s approval. When a district is closed incremental revenue flows to the general fund of the city and other government entities that levy a property tax. The Boston Store subsidy was actually the second such city subsidy in the last decade. In 2014 the Common Council approved a deal to gave the company $300,000 a year through January 2018 to maintain its 750 corporate jobs downtown. The company kept that promise before being liquidated.